Equaline Mouthrince won't open. Contains alcohol. I am used to caps you squeeze on the sides to turn open (counterclockwise). No matter how much I tried it would not open. I had to pierce a hole at the bottom of the bottle and pour the contents in another bottle. I wish I had not done so however and returned it. For when I put it in my mouth for the first time I was very surprised by the taste of alcohol and how bad it tasted. The product is light tan instead of blueish so the unwary will think it is alcohol-less. How base! 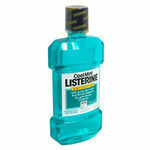 Even though I brush my teeth regularly, I use an oral rinse afterwards tokill germs and to keep my breath fresh. 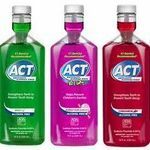 I have found that house brands for personal care items can be a great value. Equaline is one of the house brand names for the SuperValu chain. I buy the Equaline Antiseptic oral Rinse at their Jewel chain which is in the Chicago area. The label compares this house brand to Crest Pro Health. The bottle says that the Equaline Antiseptic Oral Rinse mouthwash kills germs, fights plaque, fights gingivitis and fights bad breath. 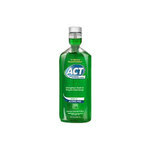 The label also says that the Equaline Antiseptic Oral Rinse contains no alcohol. 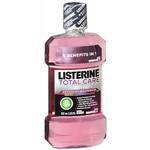 The directions say to gargle 4 teaspoons (or a capful using the handy cap on the bottle) for 30 seconds twice a day. I have found that regular uns does help preserve good breath. Also, I have had no teeth or gum disease while using this product. 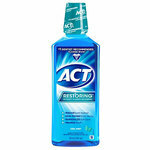 I credet brushing my teeth and good genetics for that but the Equaline Antiseptic Oral Rinse has likely helped. I can recommend this product. Thanks for reading. God bless! Please rate this review and check out my other reviews.